On the eve of a fictional G8 summit being held in Canada, a dastardly US pharmaceutical company holds a series of experimental vaccine trials in Bogota, Columbia. The trials, to put it mildly, have a number of unexpected consequences. In spite of some drastic and bloody attempts to cover up the fiasco, the vaccinations precipitate the outbreak of a biological weapon that could conceivably take millions of lives. Columbian labour leader Maria (Mia Maestro) and a Canadian bioterrorism expert (James Purefoy) must race to find the antidote, and attempt to expose the cover-up as the infection threatens to descend on an unsuspecting populace. Bioterrorism, the insatiable nature of corporate greed and the opportunism of wily politicos are all grist for the mill in this 2-part Canadian miniseries. Released to wide acclaim in its homeland, the series makes some interesting and pertinent points about the current political climate, or to put it more aptly, the political climate of early 2007 when the series was produced. Though nowadays falling share prices, trade tariffs and the global economic meltdown might be more pressing concerns than the potential threat of biological warfare, The Summit nonetheless paints a vivid picture of behind-the-scenes political machinations, allowing the tension to build throughout its three-hour running time before swelling to a satisfying and convincing crescendo. Maestro is excellent as the grief-torn mother on a desperate search for justice, and the large ensemble cast likewise contribute well-rounded and convincing performances. Christopher Plummer is a little stereotypical as the fiendish US president determined to hijack to summit in favour of a controversial security bill, but Bruce Greenwood and Nigel Bennet are perfectly cast as the Canadian and British leaders respectively, with Bennet in particular delivering a much ballsier PM than we’re used to seeing on the screen. Or in real life, for that matter. 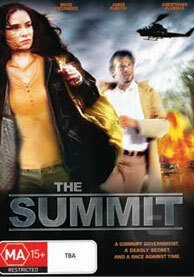 With first-rate cinematography and some superb direction courtesy of Nick Copus (The 4400), The Summit is a polished and compelling drama that will appeal to anyone of a more liberal bent. Featuring numerous stalwarts of the Canadian screen, the acting is universally strong and provides a good counter to some of the more outlandish elements of the plot. It must be noted that this is not an objective look at American policy abroad or the tenets of capitalist trade practises. Put mildly, the US takes a bashing here, while Canadians mostly come across as noble and truth-loving creatures intent on improving the lot of the world’s impoverished masses. Be that as it may the production is a definite success, and one that will resonate long after its final scene has played out.